Santa Letters: Write a letter to Santa and send it to the North Pole by dropping it in the LEGO mailbox. Winter Wonderland Big Build: Test your building skills by helping the LEGOLAND Discovery Center Master Model Builder construct a LEGO Winter Wonderland. Design your own LEGO creations to add to the winter landscape and learn how to make miniature holiday trees out of LEGO brick. 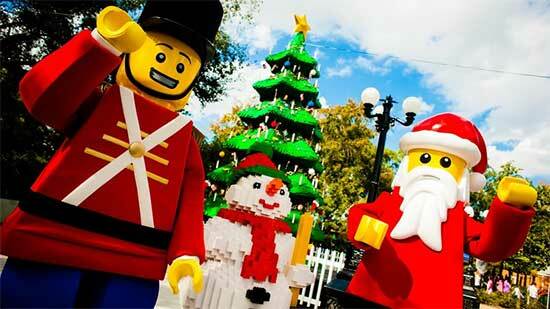 Santa Invasion: Old Saint Nick has taken over MINILAND for the holiday season. Scavenger Hunt: It’s a winter wonderland everywhere you look in MINILAND. Be on the lookout for mischievous elves, find them all for a chance to win an annual pass. Holiday activities are included in the price of admission. Pre-booking tickets is recommended for guaranteed entrance by visiting www.LEGOLANDDiscoveryCenter.com/dallasfw. Shop the Retail Store for the gift on every child’s list – LEGO! Find unique and hard to find products and sets. Holiday Hours: Christmas Eve from 10 a.m. to 6:30 p.m., Christmas Day from 12 p.m. to 6 p.m. and New Year’s Day from 10 a.m. to 6 p.m. Last admission is two hours prior to closing. Hours: Monday – Friday, 10 a.m. to 6 p.m.; Saturday, 10 a.m. to 8 p.m.; and Sunday, 11 a.m. to 6:30 p.m. – last admission two hours prior to closing.